Step 1: Prepare the filling. Heat the 60g of olive oil in a saucepan, add the onion and the zucchini and sauté for 5-6 minutes, until they soften and become a nice golden brown colour. Remove from the heat and place the ingredients in a big bowl. Add the cheese, the dill, the spearmint, the salt, the pepper, the strained raisins and the eggs in a bowl, mix well and set the filling aside. Step 2: Prepare the zucchini flowers. Stuff the flowers carefully with the filling. 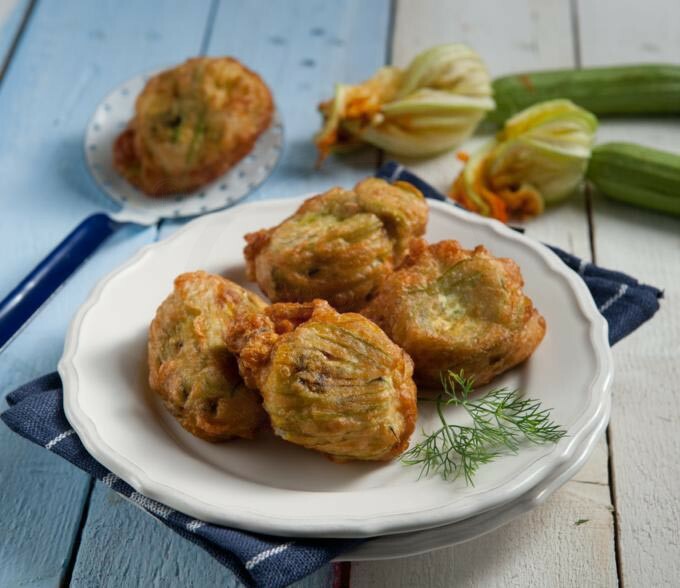 When stuffing the zucchini flowers, don't fill right to the top. Leave some space so that you can fold the ends over to close the flowers. Set the stuffed flowers aside. Step 3: Prepare the batter. Put the beer in a bowl and add some salt and the flour and mix very well until it becomes a smooth batter. Step 4: Heat the olive oil for frying in a deep frying pan. Dip the flowers one by one in the batter and then place them in the frying pan with the hot olive oil. Fry the flowers for a few minutes until golden brown. Step 5: Remove the flowers from the frying pan and place on paper napkins for 5 minutes to drain off the excess oil. A wonderful meze to enjoy with a glass of wine. Traditional cheese like melichloro and kalathaki from Lemnos lend their rich flavour - making this dish special.